Most people and firms sense that social and market forces are changing “everything,” but they don’t understand how exactly. This page can be your guide to understanding the shifts and flowing with them, so you can adapt and thrive. Are you ready? Let’s dive in. We have heard for years that “digital technology” is wonderful, but digital social is changing the structures of how people live and work around the world. Digital social and data are invalidating many of the 20th century “golden rule” career assumptions. Here’s why. The Industrial Economy is fading in favor of the emerging Knowledge Economy. The Industrial Economy featured large organizations, long product life cycles and unprecedented wealth (what we used to call “stability”). The new Knowledge Economy will feature even more wealth, but only after a period of significant disruption. Its structures will be much different (fluid & networked). Fast Company [magazine] sure called this one, during Web 1.0. Free agency, rather than “lifetime employment,” is rapidly becoming the default. Digital social networks are changing the economics of relationships. I have been in professional services for 25 years. I like to think that people are rational. However, due to client work in social business and research into evolutionary psychology, I now appreciate that two thirds of all human communication is “social.” Anything that significantly changes sociality will be HUGE for human beings; it will disrupt most human habits and institutions. This may sound like an exaggeration, but it isn’t if you really consider putting sociality “on steroids.” But 99.9% of all people don’t understand how to use digital social networks to reach their goals. In the context of careers, people are treating “social networks” as resumes, “content,” “pictures.” But content is a supporting factor in social networks, which produce the most pleasure and value when people use them to interact. Knowing how to use digital social networks to interact is the most important thing you can do to take advantage of “the 21st century career.” This page shares links to the best how-to resources. Read Executive Career and Job Search Resources for more on the drivers of disruption and how you can work through emotional issues that most executives face (“careers” will never be the same). Read the Social Channel Executive Summary to glimpse the economic disruption drivers and opportunities. The social web and Internet give you unprecedented choice, but people are in the early stages of learning to use the tools. Consider these opportunities in reverse order; the most important ones are first. Create your career strategy. Today’s unprecedented opportunity and choice increase the need for strategy. Strategy is founded on a rigorous analysis of your passions and strengths, and your assessment of market demand. Your strategy will help you create your digital networks (below). Create your digital networks with purpose. Professional and personal networks have always been our most powerful support systems, but now they are digital and available to everyone. Digital networks are a new tool (weapon); if you are not using them, you risk losing competitiveness. This applies to firms and individuals. Based on your strategy, whom do you need to engage to make it happen? Define your stakeholders, and select the social networks to which you commit based on stakeholders. Use our Relationship Value Map. 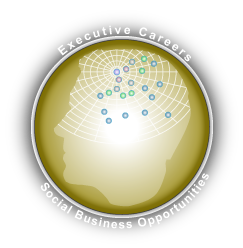 Get on Twitter, which has mainstreamed for executives. It can increase your productivity in two key ways: you can use it to create your own news network from people you trust most and journals and news outlets, which all post on Twitter now. It is also fast and easy to share your thoughts, links and other things. CSRA’s Value Vectors make this easy. Get your work and thoughts online. Even Global500 CEOs are increasingly online because various stakeholders expect to read their understanding of their firms’ challenges, and what they are doing to meet them. Blogging and video are two common methods. By the way, it has to be you, this isn’t the PR of yesterday. Of course, most leaders get coaching, but if you aren’t transparent and authentic, you might do more harm than good. All specialists, regardless of career stage, will make themselves easier to hire by getting their thoughts online. (Silicon) Valley thought leaders who are driving cutting edge technology and disruption. They tend to use it most. Early Majority business executives are adopting; they typically use it less than digerati, but they notice leaders who have presences. Brands and consultants are a mixed bag. They are trying but usually slack off after a short time. Googlers are comprised of Google employees and fans of Google or Google+. Google is pushing Google+ into a hyperlocal direction, so expect to see local community activity. In-depth CSRA analyses and reports on career transformation. Some of the slides repeat, but they have different emphases, so check out the decks before watching/listening to save time. Drive Job and Consulting Opportunities with Social Networks (presented at Northwestern University Kellogg School of Management) [slides | video ~1.2 hour]. Shows how you don’t have to choose, thereby creating more opportunity for yourself. Social Networks: 21st Century Career Accelerator (presented at Northwestern University Kellogg School of Management). This has some of the same material as the above, but it is more tactical (how to) [slides | video ~1.2 hour]. Converting LinkedIn, Facebook and Twitter into Business You Can Put In the Bank, Institute of Management Consultants [podcast ~1 hour]. PSVillage podcast on Web 2.0 for executive job search. Using LinkedIn to Build Your Consulting Practice and Career, Midwest Society of Management Consultants. [slides]. How-to focus on building a consulting practice with LinkedIn, supported by Twitter and Facebook. Using LinkedIn to Build Your Business & Career, University of Chicago Booth Women’s Business Group [slides]. How-to career focus using LinkedIn, Twitter and Facebook. More career-focused posts and articles (strategic). More job search posts and articles (tactical). Responding to post that suggests enterprises must transform how they think about, and treat, "employees"